Mix brown sugar and margarine. Add egg and molasses. In a separate bowl, mix together flour, salt, baking soda, cloves, cinnamon, and ginger. Sift and stir into other mixture. Wrap in wax paper and refrigerate overnight. 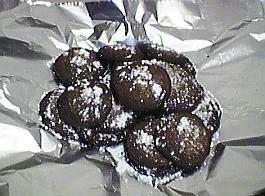 Then roll into walnut-sized balls and dip tops in white sugar, then place on greased cookie sheets. Bake at 375º F for 12-13 minutes.